Versions: This course is valid for Access 2000 through 2003. If you are using Access 2007 or 2010, you will still benefit from this course. You will find that the concepts are the same, but there are cosmetic differences between the versions. Order before 4/28/2019 to get a FREE upgrade to our Access 2010 version! This series of classes (320-329) is all about Recordsets. Every class will focus on Recordset creation. Our goal is to add Inventory Control (Products In, Products Out, and Purchase Orders) to our PC Resale database that we've been building since Access 101. In today's class we're going to start with the basics of recordsets. You will first learn what a Recordset is, how to create a Recordset, different uses for Recordsets. 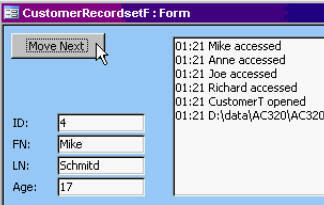 In a nutshell, a Recordset is a way to access the data and structure of a table or query from Visual Basic programming. Knowing how to work with Recordsets opens up a whole new world of possibilities for your database development. You will learn about DAO, ADO, references, and the different object libraries. You will learn how to create a Recordset object in VBA code to detemine information about your database. You will learn how to create a Recordset to loop through all of the records in a table. You'll learn about variables and their scope. You'll learn how to create buttons to move around inside a Recordset manually with MoveNext and MovePrevious. 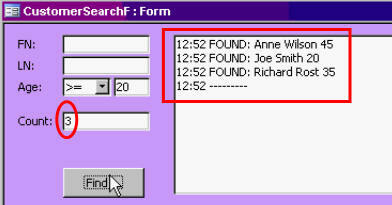 We'll learn how to use a Recordset and the FindFirst method to search for records inside of your table. When to use ! vs .
Richard on 1/1/2008: Recordset basics, creating a recordset, moving around in recordsets, finding records. BRYAN binkerd on 7/1/2009: on lesson 02, first recordset time frame 0736, I understand the StatusText = S & vbnewline but I don't understand the "& StatusText" that follows the statement. It takes X, adds A to the beginning, and then whatever X was there before. It's so you can keep a long listing of continuous "status" information. bryan binkerd on 7/3/2009: thanks for the clarification. You rock. I have started a db for conducting a community survey. I am having difficulty bringing the responder information, questions, responses, etc. together for a tabulated summary report. Is this something that could be accomplished with Record Sets? Richard Rost on 7/31/2009: Margaret, tell me more about what your report needs to look like. Have you tried a CROSSTAB query? I have a Response form for each of the households that return the survey. The main form has the name and information that I need to fill in, such as #of persons in household, combined income, #Over 65 and #Under 18. The Sub form has information that I can pick from drop down boxes (gender, years at address, marital status, and comments. This is the point where I am stuck. I would really like to generate two reports. The first would list all of the survey responses sorted by household. The second needs to have the counts or sums of each response (count of male, count of female, sum of persons Over 65, Rate of Return, % Moderate Income, % Low Income, Average Income, etc.). If you can get me to that point, I think that I will be able to set the detail section of the report as not visible and then put all of the calculations in the report footer. I tried a crosstab query, but I don't know how to use this in a report. Any help you can give me will be very much appreciated. Richard Rost on 8/3/2009: Margaret, why not just GROUP the report based on each respondent, and then put the calculations in the footer of the group? You can use the =SUM(Field) or =COUNT(Field) functions in that footer to calculate your values. Bert Jansen on 11/23/2009: Dear Richard,How can you make a report of the StatusText? Richard Rost on 11/25/2009: Bert, I don't understand your question. Can you please clarify? What do you mean by "report of the StatusText?" Bert Jansen on 11/25/2009: Dear Richard, I mean if I want to print all the data in the statustext you've created like "Anne wilson 45",How can I do that? Richard Rost on 12/13/2009: If you actually want to PRINT the statustext data, then I would recommend creating a status TABLE, binding that control (the big text box) to a field in your table, and then storing it that way. Then you can print it if you want by making a report based on it. Chris on 3/28/2010: AC320.2 TS 4:32 - I noticed that you create the object db and rs and then you destroy it (Clean it up) backward - i.e. set rs to nothing then the same with db. I assume by this that there is a particular order of creation and tidying. It this assumption correct? This just goes back to my C/C++ programming days. In C/C++ you have to remember to manually clean up any variable pointers and other objects yourself, and in the correct order, otherwise you end up with craziness in your programs. Things called NULL POINTERS (pointers to nothing) can wreck havoc in your programs. Think of object variables like plastic containers. If you declare a variable to a database object, that's a big container. If you then declare a variable to a recordset, then that's a container INSIDE a bigger container. It's dependent on the database object to exist. HOWEVER, none of this really matters in VB or VBA because Visual Basic is very good at cleaning up after you. The guys who created VB realized that most people using it aren't professional programmers, so they made it so the language cleans up most things like this for you... unlike in C/C++ where you have to do all of the housekeeping yourself... it's a trade-off for more power to control variables right down to their memory address. It certainly should. Make sure you're using DAO and not ADO as your recordset type. Check your REFERENCES in the VBA editor. Dana Michaels on 11/27/2011: when I click Microsoft DAO 3.6 Object Library and try to save changes - I am presented with the error "Name conflicts with existing module, projet or object libarary. Make sure you don't have any other DAO or ADO modules checked. If that still doesn't work, what version of Access are you working with? Scott Adkins on 12/29/2011: This is a cool class. With this status log, I would like to use it to do error checking on a form. What I am looking for is null or -0 values. When it checks the text box and finds a null or 0, can it highlight that entry and ... hyperlink it to the field that needs fixing? What do you mean hyperlink to the control? Scott Adkins on 2/26/2012: Richard, I just noticed this. When you copy a text box, and then paste it, the pasted box shows up where the mouse pointer is. When I paste it, it shows up on the upper right corner. Is there a way to fix this? You could do it that way too. In programming, there are always 3 ways to do everything. This is the way I like to do it. Post here how YOU would write it, so everyone else could see. Kevin O'Malley on 3/15/2012: I get a run time error 3077: Syntax error (missing operator) in expression whenever I try to use the Age feature (time: 8:05). When I debug it highlights "rs.FindNext MySQL". It only does this if I try to search by age using the combo box. Any idea what is going wrong? Let me see your code building the SQL statement. MySQL = MySQL & " AND "
MySQL = "LastName LIKE '*" & LastName & "*'"""
HINT: You're missing an equal sign. Can you figure out where? Kevin on 3/15/2012: For the life of me I do not see it. I have compared line for line to the video and I can't see where I am missing an = sign. Also, when are you suppose to use a single quote vs. double quotes? But I forgot that in that class I created a combo box with the different equality/inequality signs in it (=,<,>,etc.). So make sure that combo box is working correctly first. If that's not it, I need to see your code again. MySQL = "FirstName LIKE '*" & FirstName & "*'"
MySQL = MySQL & "LastName LIKE '*" & LastName & "*'"
Thanks Rick. I love all the courses and appreciate how fast you get back to me. Happy St. Pat's day! MySQL = MySQL & "Age >= 20"
No need to add on Age to the end of that again. Can you send me your database? ZIP it up and email it to amicron@gmail.com. Remove any sensitive data. Sissoko on 3/20/2012: this may help others..
Is there something wrong right in front of me that I'm not noticing? Mark Stute on 4/26/2014: Hi Richard, I have come across databases that use the term "Bookmark" in VB code. Do you cover the use of Bookmark in any of your lessons? Not really. Perhaps in a future lesson. It won't make me select MS DAO 3.6. Do they have something that is equivalent? Kevin, first I got the same error message because I put quotes around the AgeEq control. Once you remove them, the problem was fixed. Please see below. So when you click the button again it doesn't keep moving to the next record and the next? Mohamed Salim on 8/6/2016: Yea when i click the button again, it won't keep moving to the next record and the next. Note that i use Access 2016, and i saw many people who have Access 2010 + facing the same issue. Whereas the other methods like Add,delete,update are working just fine. Thank you for your concern and looking forward for a solution. Mohamed Salim on 8/6/2016: Mr Alex, actually my comment was a follow up with my first question, which was about the recordset Rs.movenext that it wont skip records and its only skip one record as a click the button. So i replied yes it wont skip records and i use Access 2016. So is there a way to fix this issue? I just want to skip record by record as a click a button. Thanks. Mohamed Salim on 8/11/2016: Hello Computer Learning Zone family. I'am stuck. I have built a complete Recordset code except that when I want to Rs.Movenext, it won't keep going to the next record and the next record, and its only moves for one record then stop. How I can make it work to move to next record as I keep clicking next!However, The other methods works fine like Add,Eddit,Delete. Note that I have access 2016. Thank you. Gioia Heiser on 2/10/2018: For access 2013, 2016 and Office 365 which version DAO library should we use? Which versions do you have available? Gioia Heiser on 3/9/2018: I have only one: Microsoft DAO 3.6 Object Library however when I check the box to add it I get "Error in Loading DLL". I'm using Office 365 on a 64 bit Windows 10 Home Machine. The only other references I have loaded are: Visual Basic for Applications, Microsoft Access 16.0 Object Library and OLE Automation. This may help, do at own risk.